Growler Discounts Now Extended to Everyone! Reading on Tuesday, August 5. Used dartboard available for free! Beer and Cheese Night III: Reminder and Details. 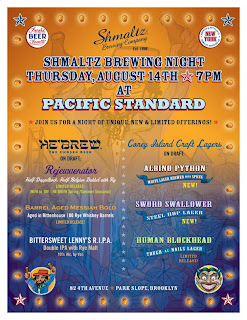 He'Brew/Coney Island event August 14. Big-time comedy night on Wednesday! First anniversary on September 5. Movie night July 21 at 8 pm.